Bolivia: Mt. Bethel UMC Team Checks In! The Mt. Bethel UMC mission team is currently in Quesimpuco, Bolivia. 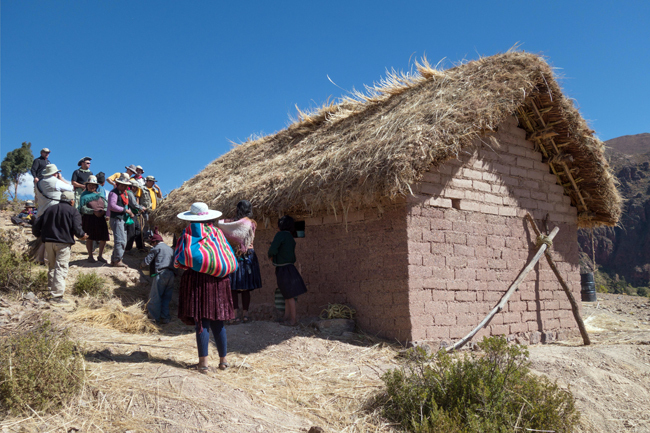 Each year, a group of men from Marietta, Ga., look forward to spending time together serving the people in this remote Andean village and sharing during devotions. SIFAT’s executive director Tom Corson, administrator Terry Haynes and board member Art Stephenson joined this team. Bert Blanchard, a former team leader, could not go this year, but he has been sending out daily updates he receives from the team to family and former team members. Bert’s updates include photos, descriptions and stories from previous years that will help you understand the landscape and culture of the area. For more information on SIFAT’s work in Quesimpuco, download our latest update here. 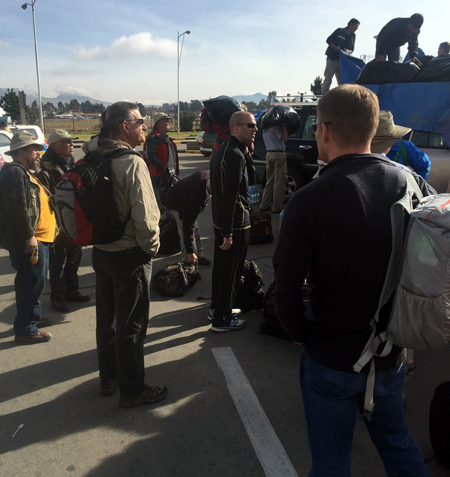 The team left Atlanta on Friday, October 23, to begin the long journey to Quesimpuco. We have combined Bert’s updates from Saturday through Monday into this first post. Tomorrow, we’ll post the next couple days of updates. The team made it safely to La Paz after a long overnight flight. Everyone and everything made it through customs, and the group ate breakfast before starting the long road trip. They were able to send the photo below. Local guys help the team load their luggage on the roofs of jeeps for the second leg of their trip to Quesimpuco – a day-long drive on mountain roads! I received a voicemail this morning from Tom, who was using Isaac’s (SIFAT Bolivia staff member and Benjo’s son) cell phone. They drove to the top of a mountain (over 14,000 ft.) where he has a weak, but workable phone signal to deliver a message that everyone was safe and happy to be in Quesimpuco. The men were tired from the long drive yesterday and went to bed after some warm soup and bread prepared by Mr. Cassimiro, who lives nearby. They are staying in the bunkhouse on the edge of town, about a one-mile walk away. This building was built by previous teams several years ago to support groups like ours serving in the area. It is a sturdy concrete block house with a tin roof, skylights, four bathrooms, a kitchen, six bunkrooms and a main dining/meeting room. The running water is clean, but not sterilized, so they have a gravity-fed filtration pot that the team will keep filling and drawing for drinking water. Normally, there is a generator to power lights at night, but Tom said that it is not working. The men will be utilizing their flashlights a lot at night. No television, radio, internet, etc. The jeeps and trucks used by the team will normally be the only vehicles in town; everyone walks to get where they need to go! It is a welcome and very peaceful escape from the busy American way of life. 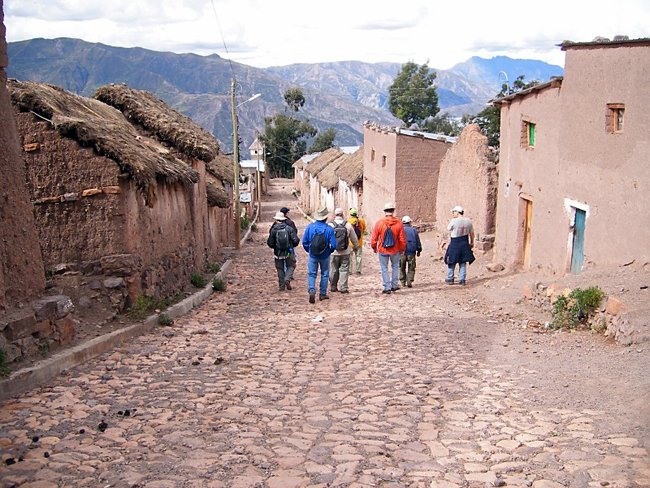 Quesimpuco is a primitive village, though now the town has electricity. They will have two church services today at the little yellow church in Quesimpuco. First, they’ll attend a morning service, where the team will be welcomed with singing and friendly Bolivian handshakes, which includes a hug. Then, they will each be presented with a beautiful flowered wreath around their neck. When you see these flowers and realize that they are handmade from plants picked around this arid, somewhat barren land, you understand how much time and effort was made to create these gestures of love and appreciation. 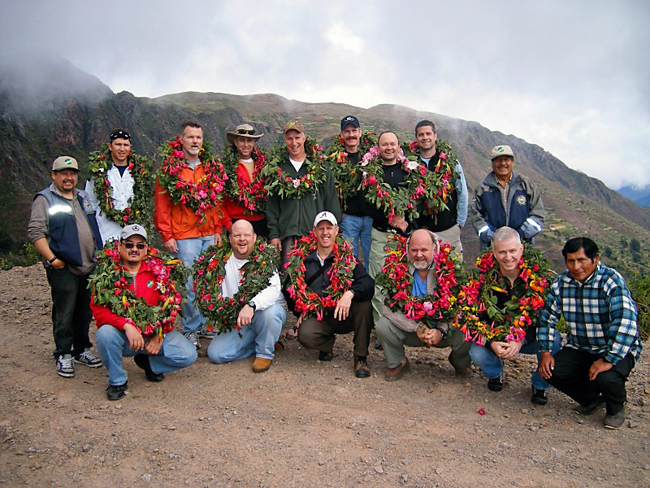 The villagers create wreaths to present to the visiting team. It takes much time and effort to hike to find flowers in the arid, somewhat barren land. Pastor Pedro will lead worship, scripture reading and preach a sermon. Pedro, a native from the region, speaks Spanish and the local Quechua language that is so important, especially to communicate with the elderly. 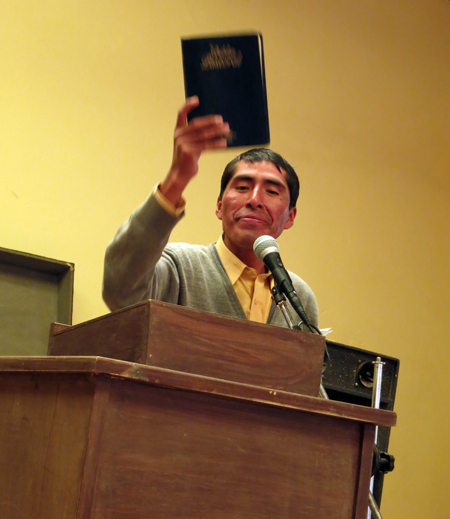 Pedro will also ask Andy Rogers to offer a devotion or scripture that Tom will translate into Spanish, and Pedro into Quechua. They will also allow the Mt. Bethel team to participate in the singing and worship. They don’t seem to care when we sing badly, either (thank goodness!). Later today, there will be another worship service for the farmers, who work every day. Animals don’t know it’s Sunday! They cannot leave the fields or flocks until late in the day. The team will walk around the village and get to meet old friends. You are humbled by the joy and love these people have, despite their abject poverty and physical challenges. Everyone is doing well! They had a nice day yesterday, getting acclimated to the altitude and the simple village life. After church, the team set up a treat for the children. 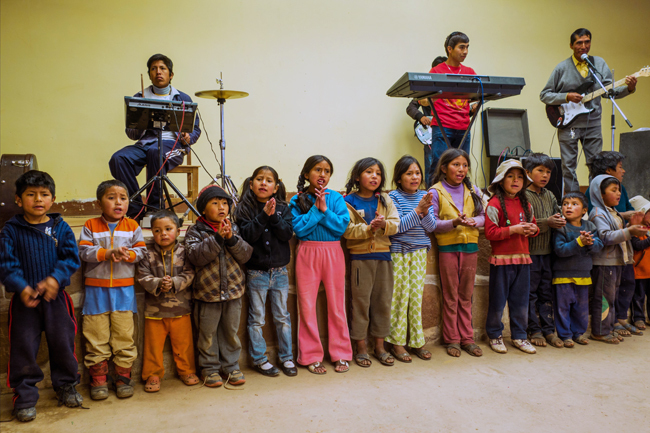 With a digital camera and portable printer, they made photos of the children in Quesimpuco! These kids rarely get to see their own image. There are not many photos to share with their family, so this was very exciting for them. About 40 children participated. It is also a great way for the men to meet the children, who love to play! They will wear out the guys with games of chase/tag, jump rope, soccer and basketball. This year’s team brought a digital camera and portable printer to take photos of the children. Having printed pictures is a rare treat for families in Quesimpuco and is an exciting activity. About 40 children participated in the team’s activity. The generator is working now, so they have some power again for lights at night. The kitchen features a propane powered stove and oven, so they can prepare hot meals and coffee even if the power is out. The bathrooms feature flush toilets, and crude showers, but NO hot water. After a couple of days working in the dusty mountains, the guys will get to experience a nice cold Quesimpuco shower. You can tell by the high pitched yell when they hit the cold water. Most homes in the village are simple handmade adobe brick with a straw-thatched roof and a dirt floor. Typically one 9’x12′ room is shared by the whole family. They sleep on pallets made from goatskins and straw mattresses. The homes are built by the owners, usually with help from the entire village in a festive “house raising” atmosphere. This is a photo of a typical handmade, adobe brick home with a thatched roof. 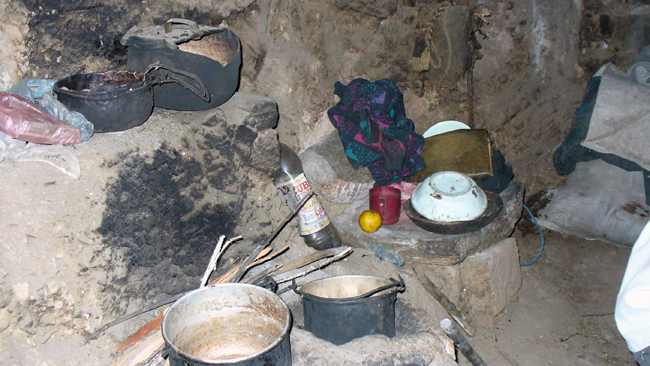 Most homes have a cooking area in the corner with an open fire with carefully placed rocks to form a platform for pots to boil stew, soup, etc. There is no chimney, but perhaps a small outlet in the roof or an opening in the wall, so the smoke can escape. Smoke inhalation is a major health hazard for these people, but there are some benefits, too. The smoke keeps bugs away, and the tar from the smoke helps to waterproof the straw roof. Most homes have a single terracotta sink installed outside the home for washing and drinking. Bathrooms are outdoors, and paper is expensive, so they use whatever nature will provide for hygiene. A typical kitchen in a corner of a home.